Miatid Amini makes his way with his family onto a truck in Moonachie, N.J., on Tuesday. Frank Mercadante, right, assists. TETERBORO, N.J., Updated at 3:15 p.m. 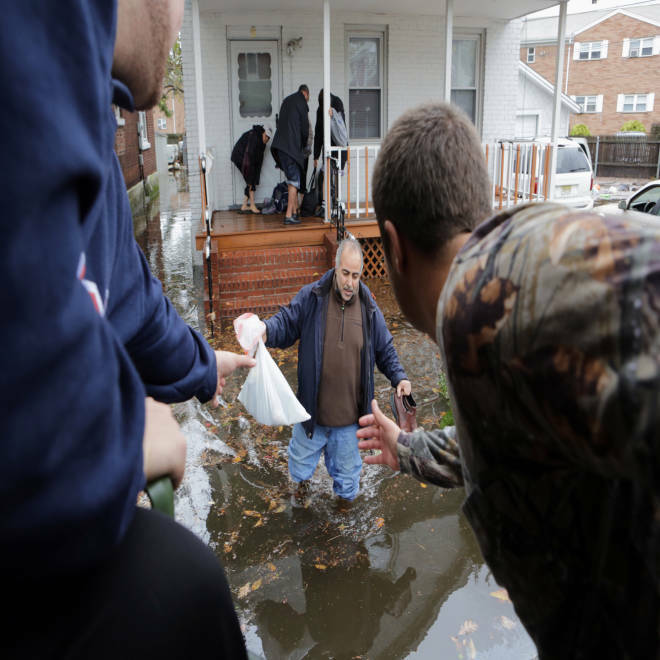 ET — Residents of four northern New Jersey towns inundated when a levee failed to hold back Sandy's storm surge said Tuesday that they were terrified to see a torrent of water racing through their streets. "Around 10 p.m. (Monday) water just started rushing down the street ... there was no stopping it," said Stefania Davi, 34, of Little Ferry, one of the four Bergen County boroughs hit by the floodwaters. Two hours later, it burst through the family's garage door. "We're doomed," Davi remembered thinking. Davi, a mother of three boys, and her husband, Salvatore, were among hundreds of residents of Moonachie, Little Ferry, South Hackensack and Hackensack drying out and trading hugs and tears early Tuesday at the Bergen County Technical High School in Teterboro. There also were tales of dramatic rescues. Frank Lofaro, 32, said he jumped on his Jet Ski to help ferry about a dozen of his neighbors in Little Ferry to waiting rescue boats. "We'll do our own share," he remembered thinking, though he acknowledged he was scared piloting the personal watercraft through the water. The flood aftermath in Moonachie, N.J., on Tuesday. He also used the Jet Ski to take his wife, Angela Valenta, 37, their two children and their 5-year-old dog, Lucky Leo, to the rescue boats. Valenta said her son, 9-year-old Angelo, was crying during the flooding. "He kept saying, 'Am I going to die?'" she said. There were conflicting accounts on whether the levee protecting the towns broke or was overtopped. The National Weather Service issued a statement Tuesday morning saying that "portions" of the towns were submerged after the levee broke. 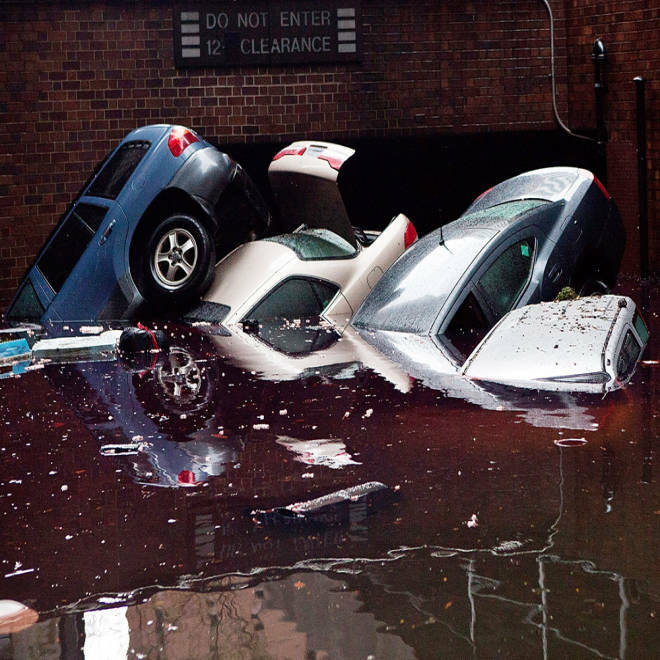 But Jeanne Baratta, a spokeswoman for Bergen County Executive Kathleen Donovan, said the flooding occurred after the swollen Hackensack River overflowed its banks, Reuters reported. Watch aerials from WCAU of the devastation from Sandy along the New Jersey Shore. Raw video. She told the New Jersey newspaper, The Record that the towns, along with parts of Carlstadt, had been "devastated" by the flood of water. And she said that as many as 1,000 residents had to leave their homes and that people in a trailer park had to climb onto the roofs of their trailers to await rescue, NBCNewYork.com reported. Among those evacuating residents were members of an extended family from the area with a military-style transport cargo truck. By mid-afternoon, they had ferried an estimated 275 passengers, including a pregnant woman, children and pets, to the shelter and other stops in the truck, which had rubber bats and lights inside from recent duty as a Halloween ride. During a trip into the flood zone residents waved the truck down as it plowed through several feet of standing water, or simply waved and cheered the crew on. "People in need, that's what we're all about," said John Mercadante, 47, president of a medical imaging center in Clifton. One of those they plucked up from their flooded doorstep was Russell Gassler, 56, and his mother, Claire, 80. The younger Gassler, a driver for a paint business, said his street was "bone dry" until the water started "raging" down it. "It just came, the waves," he said. "I just couldn't believe it." Little Ferry Mayor Mauro Raguseo, who was greeting fellow residents at the Teterboro shelter, was unable to shed any light on the cause. "All we were told is that it's a levee problem," he said. Raguseo said that rescues were continuing early Tuesday afternoon. "I'm just concerned at the moment for the people that are still in their homes," he said. 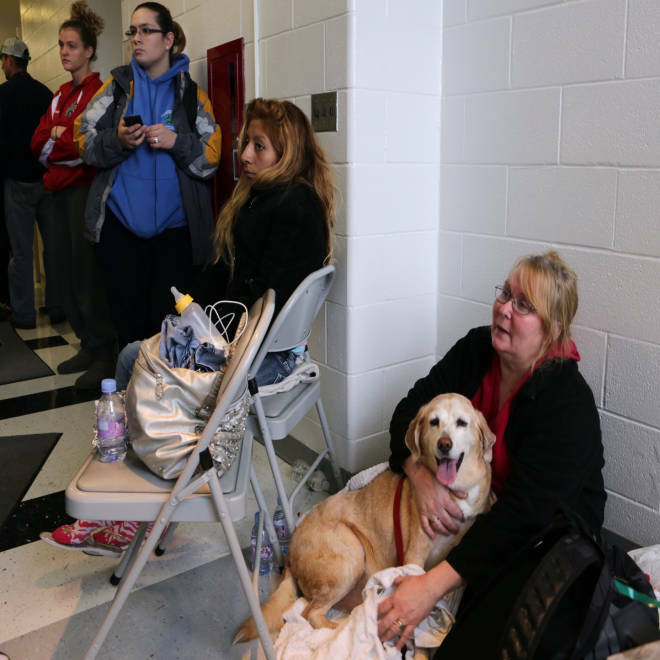 Laura Wyer sits with her dog Bailey in the Bergen County Technical School on Tuesdayafter being evacuated from her home in Moonachie, N.J.
Davi and her husband and three boys watched nervously through the night, "just praying and praying" as the floodwater lapped at the threshold of their raised first-floor living quarters. It never came in, though, before the family was rescued by boat early Tuesday, along with their 2-year-old Cocker Spaniel, Rosie. Davi, who was able to grab some family photos and computers before climbing into the boat, said she was feeling optimistic that her family would soon be back on its feet despite the ordeal. "Today's a new day and tomorrow will be another one," she said. "I survived cancer. I can survive a flood." But Mayor Raguseo said he was among the residents to feel the Sandy's full sting. "I've lost everything as well,” he said of the home that he moved into six months ago. "It's just devastating." 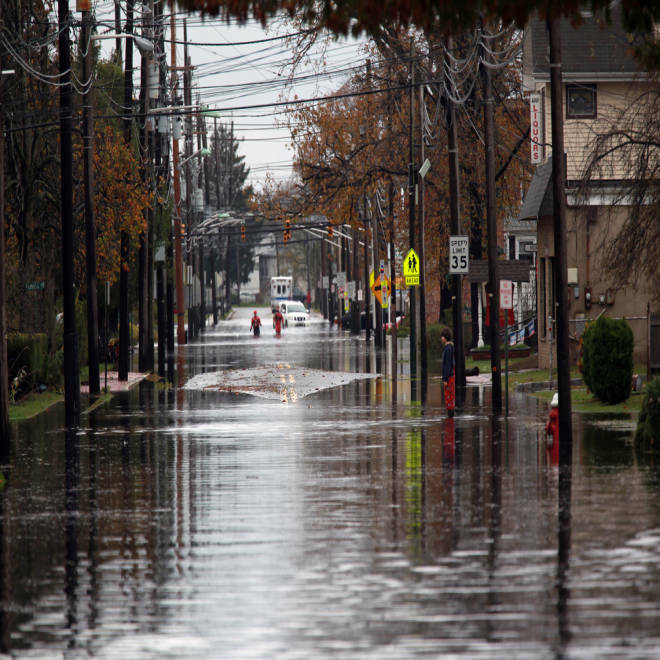 Rescuers are going door-to-door to save residents in Moonachie, N.J. stranded by floodwater caused by Sandy.